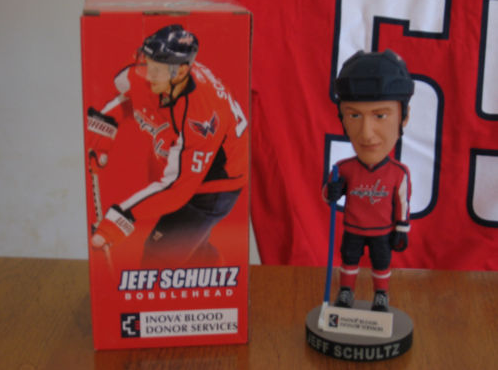 Just like all the other bobbleheads given out at the Inova Blood Drive, the latest on the mantle, Capitals defenseman Jeff Schultz, is now on eBay and already fetching a relatively high number in the first listed auction. The Inova Blood Drive bobbleheads are produced in very limited numbers (compared to say, the game-day giveaway bobbles) and only available to those who show up and donate blood. Therefore, collectors who can’t make it, or are scared of needles, end up paying decent cash for this schwag. Previous bobbleheads given out at the blood drive include Brooks Laich, Semyon Varlamov, John Carlson, and Alex Semin, and all fetch upwards of $100 on eBay. Greatest missed opportunity for a bobblehead at the blood drive: A Matt Bradley bleeding bobble. Ha. Read more about Capitals bobbleheads, plus Mike Knuble’s interview about his own. Also, see Phil’s vintage Caps bobblehead collection.